As an Intermediate and Advanced surfer, choosing surfboard fins takes on a new dynamic. You are no longer riding on the wave, letting fins steer you as you get pushed along. Fins are now critical to how you engage with the wave, essential to your speed, control and performance. All performance fins are not alike. Not all work optimally in all waves, not all work optimally in all boards. There’s fins that favour certain approaches such as power carving or progressive surfing. So how will you find what works for you? 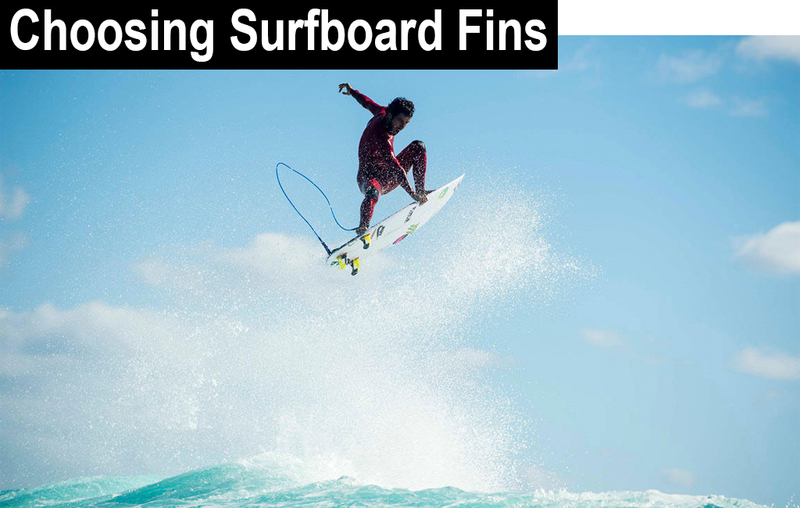 Let’s look at how the established fin brands approach giving you the best fin. Both FCS and Futures advise using your weight as a starting point to determine your scope of fin choice. Using weight as such a determining factor in your fin choice is one of the biggest pitfalls. The terms Small, Medium and Large are confusingly used to refer to three things: your weight, body size, and fin size. This leads to the common idea that if you’re say a Small weight surfer you should surf a Small sized fin. This is not what you should do. Kelly Slater, 11 times World Champion, a Small surfer by weight and body type, says he surfs a Larger fin when the waves are small and weak. He does this as a fin that is Larger has more area and generates more power from the wave. In getting optimal fins your weight is not the major consideration. While we’re talking about sizes, another misconception is that big waves need big fins. In bigger surf many elite surfers including Kelly ride fins with less area. So performing in big surf does not automatically equate to big fins. Another aspect not addressed by simply using weight is body-type. Short stockier surfers have performed well on wide stiff base fins with thinner tips. Taller or leaner surfers perform well on taller fins with more tip. Centre of gravity, the leverage you put on a fin, heaviness of foot, your stance whether wide or narrow, all play a part in how a fin will help you perform. Other factors to consider are that different fins work optimally in different surfboards. 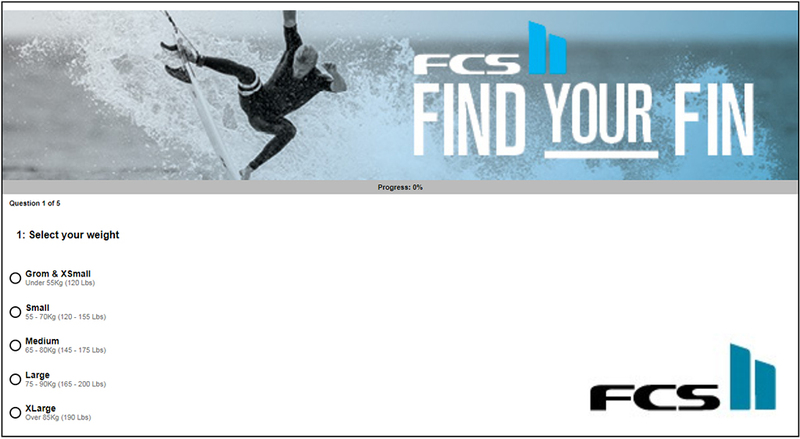 FCS actually provide a recommendation so you can match their fins to your board. Tail thickness makes a big difference on how fins feel too. If you’ve got a thicker tail, flexi fins will help bite reducing that skipping feeling. If you’ve a thin tail stiff fins flex under the more direct pressure, giving better engagement. Do you turn from the tail, you may favour a bigger fin. Or use your board rail? Rail surfing can allow you to use smaller fins that allow overall more responsive surfing. The above points should give some indication of the scope of fin considerations to progress your surfing. It’s more than picking your weight, the latest fin model, and colour. Two key things you can do to make an informed decision on how your fin choice can improve your surfing are to explore and experiment. Explore. Check elite level WSL surfers close to your body type, that you like the way they surf, and explore what fin setups they’re using. Experiment. Try lots of fins. Kelly’s signature fins have a larger side and smaller rear fin. How did he know this would optimise and fit his surfing style? Experimentation takes time. You have to work through swapping fins, in different conditions, at different breaks, on different boards. It pays off when you come up with the combination and your surfing potential is unleashed. Both FCS and Futures aid experimentation. The FCS II setup is screwless so it’s super easy to instantly switch fins. It’s all done by hand with no tool or fin key needed. Futures has a screw which means you need to mess with a fin key. Futures fins have a Ride Number though, so it’s easy to work out how a fin will perform even before you try it. FCS use wave type to categorise its four core Essential FCS II models. They have a short movie showing WSL surfer Matt Wilkinson touring the world surfing four great locations using his FCS II fins to optimise his performance at each break. FCS offer its models in 3 different constructions, PC Carbon, PC Core and Neo Glass. In the image above the constructions are identified by different graphic design. So how do the materials affect the way the fin performs? This is far from clear as all constructions are described as ‘responsive’. PC Carbon is said to offer advanced flex. Without listing all the measurements, only a few millimeters separate these Essential FCS II fin models in base and height while there’s a greater difference in area and in sweep. Do Rake or Sweep Get A Mention? What do the Rake and Sweep numbers mean? Rake and sweep are not identical but have a similar effect on how a fin helps you surf. Less Rake or sweep helps you do more pivot turns. More Rake helps you do down the line carves. The FCS II Reactor at 31 degrees gives you less Sweep, helping top to bottom surfing. 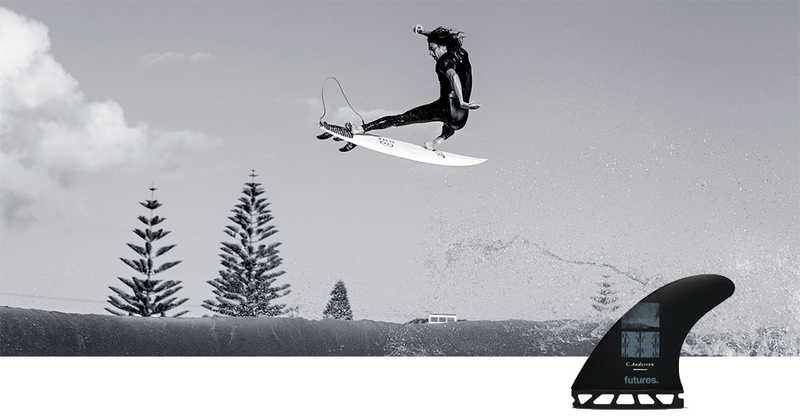 The FCS II Carver at 37 degrees gives you the most Sweep, helping down-the-line surfing. It’s about more than just the colours. If you happen to be the same body type as Filipe Toledo you could explore what he uses. For example at a down-the line-break like Jeffrey’s Bay, what surfboard fins did he ride? Filipe Toledo’s performance on his FCS II signature fins at Jeffreys Bay 2017 was mind blowing. But how did he come up with the idea of an 80/20 foil for his side fins? Filipe’s Jeffreys Bay 2017 performance was mind blowing from both a carving and progressive perspective. He rode his signature fins, that he says he designed as a blend between the FCS Performer and Mick Fanning’s fin. So Filipe, FCS Team Rider, didn’t go for the FCS II Carver fin recommended for down-the-line waves. He rode his signature fin to surf the way he wanted, to maximise his potential. 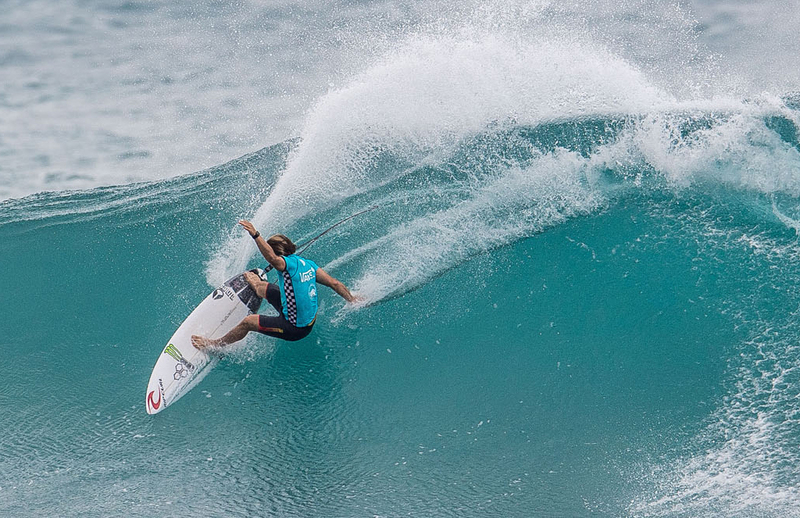 He did carve down the line at times but what gave him a critical performance advantage was his top to bottom and air game, in waves where his competitors were mostly carving. So relying on what the fin company might tell you about a fin isn’t going to necessarily help you find your best fin, nor maximise your unique potential. One of the most interesting aspects of Filipe’s signature fins is that his side fins don’t have the usual FCS foil. They have an 80/20 foil normally used on Quad rear fins to provide speed and stability. That’s exactly how they helped Filipe surf. So how did he come up with that idea? Exploration. Experimentation. There’s no question FCS fins work great, their Team and many riders on the WSL prove that. Futures has a different approach than FCS. They don’t put their fins up into categories by wave type. They have a number that indicates how a fin will help you surf. What do you want to do? Do you want to generate speed? Do you want to control speed? The Futures Ride Number will tell you what the fin will do for you. All the complex characteristics including flex, base, height, rake, sweep, area, are captured and summed up in the Ride Number. So you get an easy to understand number from 10 to 1. A 10 fin is great at helping you generate speed. When it carves it carves with the wave. A 1 fin helps you control speed, when you’ve got power or suckiness on tap. When it carves it carves through the wave. From the outset this approach helps you understand how a fin will help your surfing just by knowing its Ride Number. As an example let’s compare how FCS and Futures would select a fin for a down-the-line wave. As mentioned above, FCS recommend the FCS II Carver for open face, down-the-line waves. If this is a down-the-line wave, does the wave determine what fins you’ll use? Or do you determine how you want to surf the wave and select the fins to help you do that? Futures don’t start with the wave. Futures start with you. Do you want to generate speed on that down-the-line wave or control the speed? A high Ride Number of say 9 will help you generate speed so instead of drawn out carving turns you could surf top to bottom or go air. Alternatively a speed controlling fin with a low Ride Number of say 4 would help you do drivey surfing. The hardest part of the Ride Number is working out what Ride Number to start with that suits you. Once you work that out it’s easy to experiment going up and down the Ride Number scale to match how you want to perform. 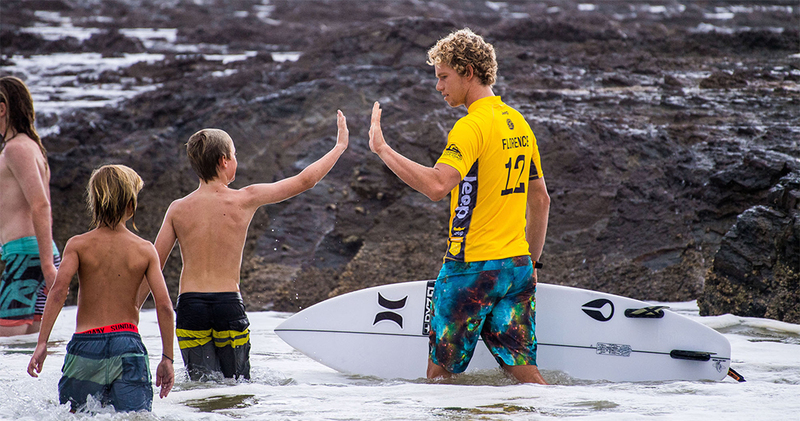 Good examples of Futures Ride Number to explore are surfers Craig Anderson and John John Florence. Both are progressive, both carve. Craig’s surfing is characterised by spontaneous airs. His signature fin has a Ride Number of 9.8, it is very good at generating speed giving him pop almost on call. He still does carving moves but more in flow with the wave. John’s surfing is characterised by power moves. His signature fins have a Ride Number of 4.0. He carves through the wave. John put on an unbelievable demonstration of power surfing at Margaret River in 2017. John still executes progressive big air moves but with a more planned approach. Futures has a range of construction methods and materials, but all these characteristics are incorporated into the Ride Number. You don’t have to choose Ride Number then try to work out what fin construction to go for. It’s worth a note that Future’s Alpha material opens a whole new world of fin design and should definitely be on your experimentation list. Alpha allows construction like nothing previous being able to vary any aspect of the fin. The Alpha multi-texture surface is another great feature reducing cavitation and increasing speed. John John Florence has an Alpha fin in addition to his original signature version. In Summary fin exploration and experimentation are vital for your surfing performance and progression. Both FCS and Futures have great fins. 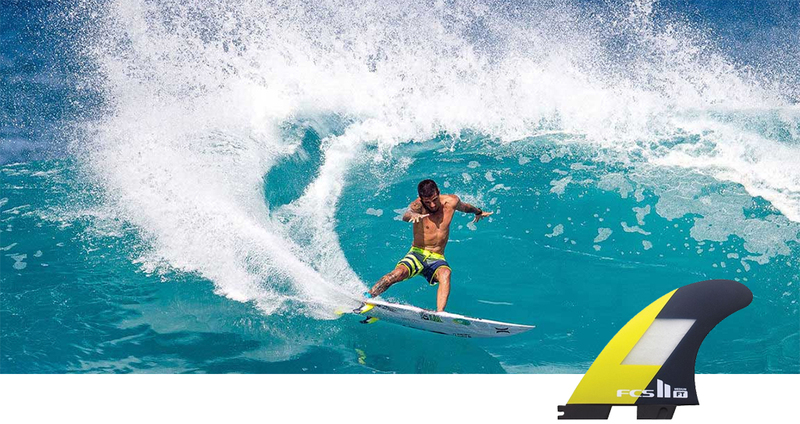 Helping you choose the best fin, FCS focus on wave type, the waves you surf. Futures focus on what you want to do on the wave. Filipe and John are examples of surfers who just didn’t take the brand narrative but explored, experimented and designed their own signature fins. They determined how they wanted to surf, and perform consistently, across vastly differing surf conditions and they chose the fins to help them do it. In our previous article we explained the benefits of mixing it up, not being stuck on one fin model setup. As part of your experimentation try different side and back fin combinations. Do your own exploration and experimentation, work out how you want to perform and get the fins that’ll help you progress your own surfing potential. Both FCS and Futures have taken a lot of the complexity out of choosing fins with their wave-suited models and Ride Number. It’s still good to know the underlying features that make a fin perform so we’ve provided the information below. Foil. This refers to the treatment of fin thickness and the way it transitions around the fin. So a foil can be a curve, it can be flat, or with a special treatment such as a vee, concave or convex. Each gives certain performance and feel. Explore. Experiment. Find the fin setup to maximise your unique potential and performance!